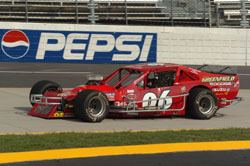 Three races into the 2005 NASCAR Whelen Modified Tour season, things weren’t looking too good for Steve Whitt. The New Jersey short tracker started out the year with a 22nd-place finish at Thompson International Speedway’s (CT) Icebreaker and then did not qualify for the next three events on the schedule – two [including one delayed until July when it rained after qualifying] at Stafford Motor Speedway (CT) and another at Riverhead Raceway (NY). The situation looked pretty bleak, in fact. But Whitt was not ready to give up. able to turn that corner in late June at Waterford Speedbowl when he started third and finished fifth. But that wasn’t a fluke. His next start at Jennerstown resulted in a finish of 18th, but after that was fifth on the mile at New Hampshire International Speedway and fourth at Beech Ridge. The reason for the boost in performance was simple. Whitt just needed the right tools to get his job behind the wheel done. Whitt now sits 14th in the point standings, entering the final two events of the season. That is a marked improvement throughout the course of the year, especially considering the hole that Whitt was in after missing three races early on. Now, the sky is the limit. the team a whole new outlook. That made the second good run come a lot easier than the first one. Showing the he belongs near the front of the field has also helped change the opinion that other drivers have of Whitt. He’s moving on up in that category. Whitt is starting to notice that on the track. Considering the direction where Whitt’s career is going, there will be plenty of more days where he’ll be working with Fuller and other drivers to collect strong finishes. 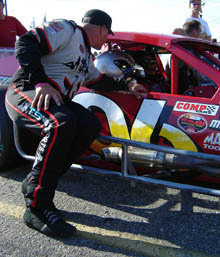 Jimmy Blewett checks in with Whitt before qualifying earlier this year at Riverhead.